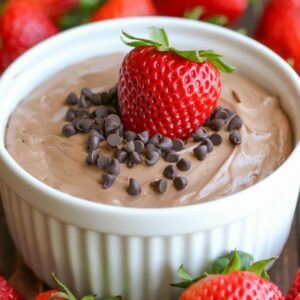 This Nutella Cheesecake Fruit Dip Is SO Easy And SO Delicious! This Dip Is A Great Dip Made With Nutella, Cream Cheese, Powdered Sugar, Cool Whip, And Topped With Mini Chocolate Chips! Place nutella, powdered sugar, and cream cheese in a bowl and mix with mixer until well combined. Fold in cool whip and mix well. Pour into your serving bowl. Top with mini chocolate chips for garnish and serve immediately. If preparing ahead of time, wait to pour into your serving bowl. Refrigerate dip and before serving mix again with spoon and then pour into bowl and serve.